At the start of the year, I decided to set myself a challenge: to forgo the pleasures of the demon drink for one full calendar month. The were several reasons for my self-imposed exile from bar street, namely to do with health, money, education and willpower. And if successful, I saw no reason that my little experiment couldn’t form the foundation of a permanent lifestyle change. But it would never herald a new teetotal me. That would just be going too far. So the results are just in… I can confirm that no alcohol passed my lips for the full duration. Nor did I attempt to snort a line of vodka through my nostrils. I guess that counts as a successful test then, right? Well, sort of. You see, in my mind, I kind of felt like I cheated a little. Not because I surreptitiously down a couple of shots when no-one was looking, but because from the first Friday night of the new year, I just knew that temptation would be too great if I went into a bar. With an agitated state of mind and unswerving self-pity, I enviously watched as my friends unwound from the stresses of the week and started to enjoy themselves. Whilst I wondered how many sugary soft drinks I could have in the month before ‘catching’ diabetes. It was clear that such a scenario would always be too uncomfortable. Hell, I even bought myself a soft drink called Soft Brew that looked similar to beer, just so that I could pretend it was. And so that strangers in the bar wouldn’t judge me as being, either a recovering alcoholic, or just a do-gooding killjoy. I even received a grateful tweet from the brewery that made Soft Brew when I mentioned on Twitter that I’d drunk it. They hoped that I had enjoyed it. That was nice. Too nice. Jack Daniels wouldn’t have done that. I replied to say that it was lovely. Just needed a shot of vodka in it. I didn’t get a response. So after that first night I changed my game plan. I decided that the easiest thing to do would be to turn down any social invites where there may be some alcohol involved. Which meant turning down all of them. Let’s face it, we like a drink in England and it’s hard not to feel left out of it if you’re drinking orange juice. I just knew that I would have no fun at all. Plus, it meant that I could study for my exams without any lost time due to late nights and groggy mornings after. So, to be honest, I didn’t really test my willpower apart from on the first Friday, a colleague’s leaving drinks, and on the following day, after my ultimate frisbee team training session. And as for my health… well, seeing as the month of prohibition coincided with revision and one assignment to be completed, the benefits of consuming no alcohol went unnoticed due to the exam stress and a reduction in my weekly fitness regime, in order to fit it as much cramming as possible. Plus, I was hardly a problem drinker, so it was never likely to be an epiphany for me. I wasn’t expecting to feel like a new man. But I probably saved myself £150 and avoided drunkenly embarrassing myself in front of at least one or two girls that I was trying to impress. So, as they say… swings and roundabouts. This month has taught me one thing. Like so many things in life, giving up the booze has both benefits and downsides. Why give up something that I enjoy? Life is all about living. Everything in moderation. 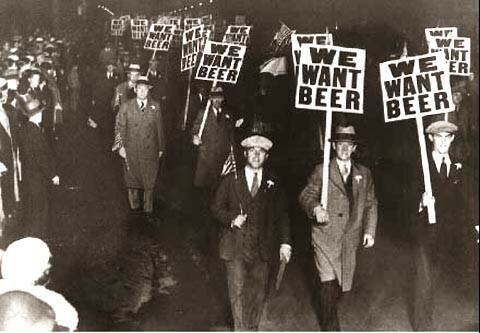 So how do you plan to celebrate this month of Prohibition, what with a Friday night only hours away? All best for exams! I’m going out with workmates to play Dodgeball! 🙂 And to drink. I had a grin on my face whilst I was reading this! Props to your willpower for going the whole month, and now to celebrate with a glass of Baileys, yes? YES! Thanks Anna and Team O. I’m sure it would have been harder on a normal month with no studies, but still an achievement I guess.